I have just started making wedding cakes for friends when they ask me. 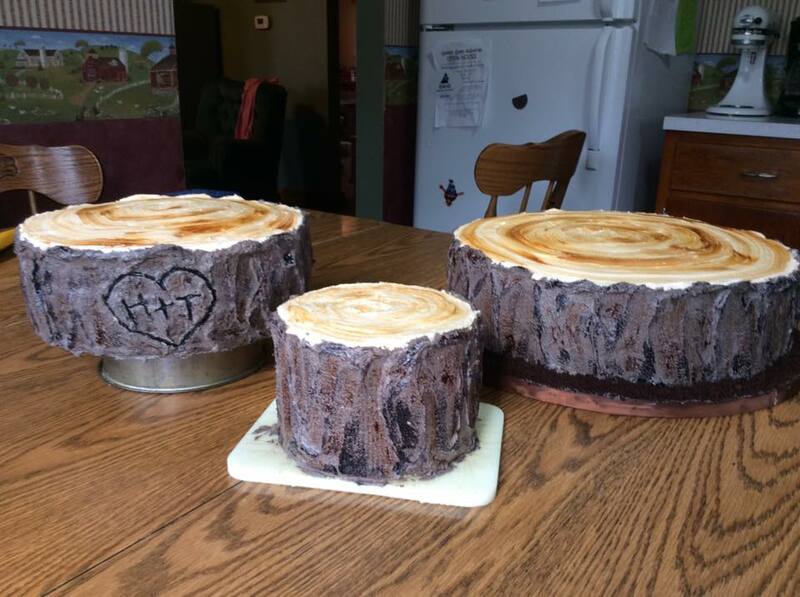 I offered to make on for a couple at our church and she wanted a rustic tree stump wedding cake, but did not want it done in fondant. I actually found it a lot easier to do in buttercream. This cake is done with a 14 inch, 10 inch, and 6 inch cake. All three tiers were a double layer of cake put together with buttercream frosting in between. 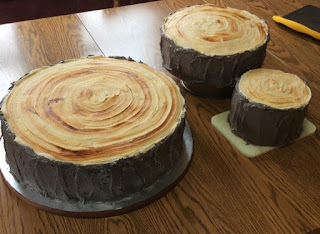 The 14 inch cake was put on a 16 inch thick cake board. 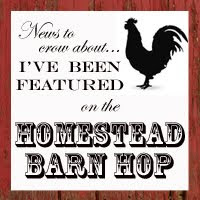 I hot glued dark brown ribbon around the edge. 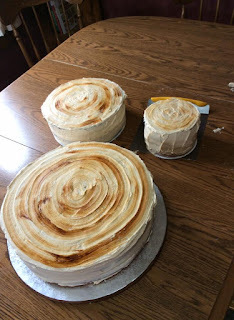 The second two tiers had a thin cake board the size of the cake. To start with I made butter cream colored with ivory food coloring. I used this to fill in the cracks in between the cake layers and frosted the tops with it. To paint the tree rings on top I used a 1 inch wide clean paint brush dipped in ivory gel food coloring. I just dipped it once for each ring which gave it the blended effect. 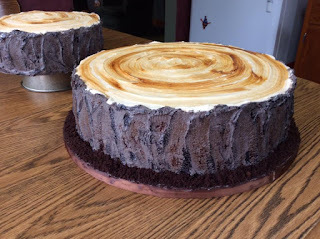 For the bark on the sides of the cake I colored the buttercream with black and chocolate brown gel food coloring. It gave it a nice earthy gray color that was perfect for the bark of the tree stumps. To apply the frosting I just used a small frosting spatula and applied it from the bottom going up in rows. What is nice about doing a tree stump is you want lots of texture. Just let the frosting do it's thing!! After I applied the tree bark I let the frosting set up for a while before I attempted to "paint" it!! Once the buttercream had crusted it was time for the fun part. First I used a wooden skewer to carve a heart in the middle tier with the couples initials in it. Then the painting commenced!! I used a small paint brush to paint around the heart and the initials and used black gel food coloring to paint it. Then I used a 1/2 inch wide flat paint brush dipped in black to go around each cake. I tried to hit the high areas with the black and made sure I got some of the bark on the top of the cake as well. After the black was done I went around each cake again this time using the ivory gel food coloring shading in areas with that. For the bottom tier I put fresh frosting around the edge and topped it with crumbled chocolate cake to resemble dirt. The morning of the wedding I assembled the cake and added the finishing touches. I used some gorgeous artificial flowers and artificial succulents and it was topped with the cake topper the couple had chosen. The cake was revealed to the couple before the wedding separately while I was there. They took pictures of their reactions seeing their cake for the first time. The look on their faces was so rewarding for me to see!!! I was thrilled to make this cake for a special couple in our church!